Republicans have not won the Senate seat being vacated by Sen. Max Baucus (D) since the advent of popular Senate elections. That they are now in position to do so speaks volumes about the importance of ex-Gov. Brian Schweitzer’s (D) surprising decision to pass on the race. Schweitzer opting against a run is arguably the biggest development in the race for the Senate so far this cycle. Sure, while three Democratic incumbents in seats that Mitt Romney won in last year’s presidential race decided to retire — the aforementioned Baucus, along with Sens. Tim Johnson (SD) and Jay Rockefeller (WV) — all of them were probably only at best slightly better than 50/50 bets to retain their seats. Schweitzer, who is more popular in Big Sky Country than his rival Baucus, probably would have been better positioned than the incumbent to win the seat. Had Schweitzer run, we probably would have switched the toss-up seat to leans Democratic, but now that he isn’t, we have instead switched it to LEANS REPUBLICAN. The likeliest Republican candidate appears to be Rep. Steve Daines, first elected last year. Daines was making noise about running even before Schweitzer made his decision, and some prominent Republicans, including a key figure in the National Republican Senatorial Committee (Sen. Rob Portman of Ohio), are raising money for him. One never knows about Republican primaries these days, but Daines could potentially have a relatively clear shot at the nomination if he wanted it. One of the current candidates for the seat, state Rep. Champ Edmunds (R), has already said he would defer to Daines if he entered the race (Edmunds would run for Daines’ House seat instead). The potential Democratic field could very well produce a female nominee: possibilities include state Superintendent of Public Instruction Denise Juneau (who is thought to be the first Native American woman ever elected to a statewide position) and Stephanie Schriock, president of EMILY’s List, a national group that supports pro-abortion rights women in races for office. Schriock, in particular, would seem to aid Republican attempts to nationalize the race. (Another prominent female Montana Democrat, state Auditor Monica Lindeen, quickly ruled out a run.) A number of other Democrats are possibilities; the party seems to have a decent bench here, so let’s not just automatically award the race to the Republicans yet. Particularly if Daines runs, comparisons to last year’s Republican failure in North Dakota are impossible to avoid. Daines, like the 2012 North Dakota Republican nominee Rick Berg, is a freshman representative who lost to a strong female Democrat (now-Sen. Heidi Heitkamp). Could Juneau, Schriock or someone else be the next Heitkamp? It’s certainly possible, although it’s also plausible that one or more of these Democrats might conclude a run for an open House seat is preferable to running against the current at-large representative, Daines, for the Senate seat. The overall Senate picture looks like this: Democrats, so long as they win back the late Sen. Frank Lautenberg’s (D) seat in New Jersey (Cory Booker is an overwhelming favorite to win the Democratic primary in August and then recapture the seat in an October special election), will hold a 55-45 edge in the Senate. At this point, we expect South Dakota and West Virginia — two open Democratic seats — to flip to the Republicans (we rate both as likely Republican, meaning the GOP is strongly favored but not guaranteed to win both). The next domino is Montana, where the Republicans now have a perceptible edge. Win those three, and Republicans are halfway to the six-seat gain they need. 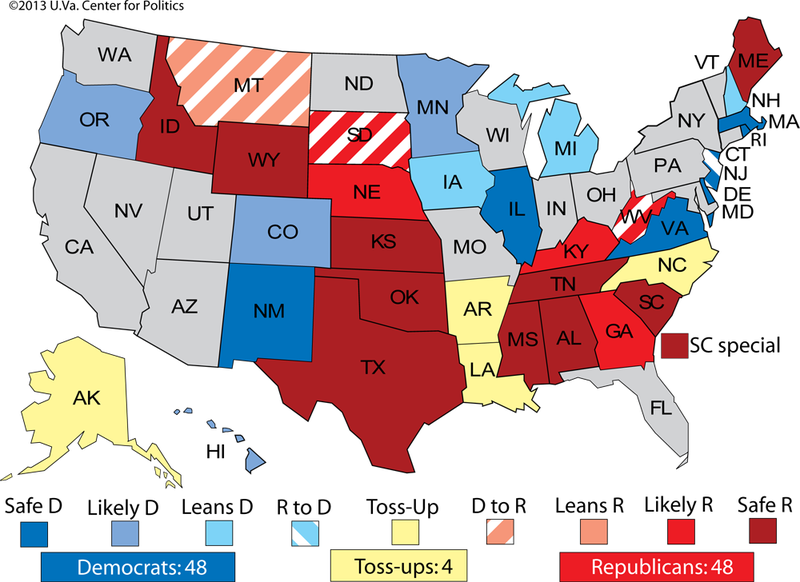 That narrows the field of true Senate toss-ups to four, which are the remaining states on this year’s Senate map won by Mitt Romney in last year’s presidential race that are represented by Democrats in the Senate: Alaska (Mark Begich), Arkansas (Mark Pryor), Louisiana (Mary Landrieu) and North Carolina (Kay Hagan). Of the four, Pryor and Landrieu seem the most vulnerable at the moment, but all should feature competitive races. Before the Schweitzer announcement, it appeared that Republicans would have to win all four of these races — defeating four out of four incumbents — to capture the Senate. Now they only have to defeat three of the four. That’s still challenging, but within the realm of possibility. Note that this update essentially narrows the Senate field to the seven Democrat-held seats that Romney won in 2012, the seats that could be called “The Red Seven.” There are other potentially competitive contests: open Democratic seats in Iowa and Michigan; an open Republican seat in Georgia; and Kentucky, where Senate Minority Leader Mitch McConnell (R) is facing what will surely be a well-funded challenge from Kentucky Secretary of State Alison Lundergan Grimes (D). But there are clear favorites in all of these races right now: Iowa and Michigan lean Democratic, and Georgia and Kentucky are likely Republican (for all the hype the Kentucky contest will receive, it’s just really hard to imagine McConnell losing, and Republicans will need to really screw up for Democrats to have a shot in the Peach State). Other races could also become competitive, but the sharp focus on the Red Seven is justifiable. Because Democrats will have to lose a net six seats — quite a lot in a single year, though with plenty of precedents — we would tentatively give the Democrats slightly favorable odds of retaining control with a reduced majority. But we’ve passed the point where a GOP Senate majority is purely theoretical, and we are approaching the point where Republican takeover of the Senate is easily imaginable, dependent on just a medium-sized wave in November 2014.